You can use this to add all of your pre-made products such as soups, entrees, sauces, and condiments that are not in the database. 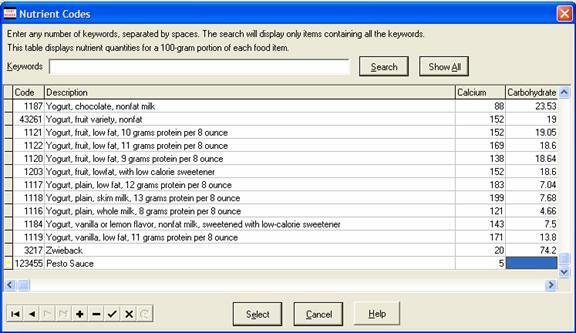 You can add additional items, edit current items, or delete items from the USDA Nutritional database. Use this feature to customize the USDA database for your specific needs. Before you add a new item, you need the nutritional data for the product. You can find this information on the box, the product webpage, or from your vendors or brokers. Make sure that the calculations are based on 100-gram weight of the item. If you are not sure how to do this, or what information you need to collect, then contact a Registered Dietitian (RD) for assistance. The new item will only be as accurate as the information you type in. 1. Go to the USDA Nutritional Database. You can access it by opening an inventory item and then click the in the Code #1 Field. You just need to access the database – you do not have to be in a specific Inventory Item to do this. 2. You should double check that the item is not in the database. You can use the search function to find items. Make sure you check all possible combinations for the item. If you want more information on searching the database, click here. 3. If you are satisfied that the item is not in the database, click the to add it. This step will send you to the bottom of the database, and a new blank line will appear. 4. You can type in a code for this item. Make sure that it is unique. Most codes in the database are 4 or 5 characters long. If you type in a 6-digit number, you will not accidentally delete an existing code. Each code must unique. If you type in a code that is in use, you will see the following error message. Type in another code if this occurs. 5. Move the cursor to the next field. You need to type in a name for this item. If you are entering in the nutritional data for a pre-made product, then use that name. If you are entering in a food name, such as cornhusks, then type in a name that you will remember. 6. Move your cursor to the next fields. You need to type in the number of grams of calcium in 100 grams of this product. If the item does not have any calcium, type in zero. If you do not know how many grams of calcium are in the product, leave it blank. Your final nutritional labels will not be accurate without all of the information. 7. Move the cursor to the next column. You need to type in the number of grams of carbohydrates in a 100-gram serving of this product. Repeat this step and fill in the cholesterol, calories, saturated fat, trans fat, fiber, iron, protein, sodium, sugars, total fat, Vitamin A and Vitamin C.
Again, if an item does not have any of the above, type in a zero. If you are not sure, leave it blank, and contact someone who can calculate these values for you. 8. When you are finished, it will save automatically. 9. You can delete an item from the USDA database. To delete the item, find it in the database. Make sure that the is to the left of the item. Click the to delete it. You will see a confirmation popup. Click OK to delete the item, click Cancel to exit. Once you delete an item, it is gone forever, and you will have to add it back in if needed. Try not to delete an item unless it is absolutely necessary. If you want to return to the Nutrition Module, click here.